Back from a 4 day break and feeling awesome! Although it seemed like the whole group of participants had "A case of the Mondays"! None the less we ploughed ahead. The problem is that there isn't any time to wait, pause or take stock. We want to get through so much material so that the participants are armed with everything they'll need to be successful, however, real learning takes time! So we push them harder but have to temper our pace with their learning. Ugh, its hard. Anyway - today we started with free fall. We had already looked at the free acceleration (which is sometimes called free fall acceleration or acceleration due to gravity). I drew a man on a roof dropping a ball. The question is, we know how fast the ball is moving at each second, but how do we know how far it has fallen? We drew a velocity vs. time graph and they shaded the area to find the displacement. This is not new - it is an application of the constant acceleration particle model and the participants liked the fact that it seemed to be kind of a review of something they'd seen before. They completed worksheet 1 as Laura and I walked around checking for understanding. 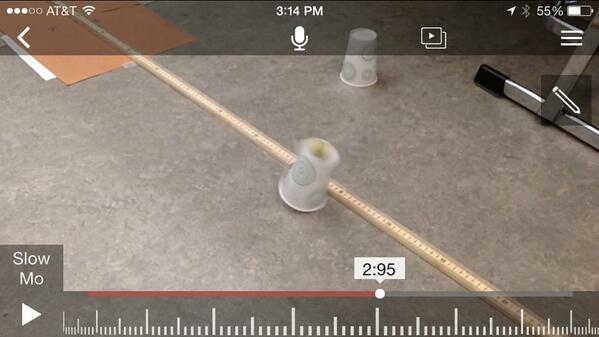 From there we did the "paradigm lab" for the projectile motion unit. I shared with all of the participants a video of a steel ball thrown across the classroom. The questions is: as you watch the slow-mo version of the ball's flight, what happens to the vertical spacing of the ball's positions and what happens to the horizontal spacing of the ball's positions? They used an old-school overhead transparency to mark the position of the ball and then answered the questions. It appeared that the horizontal spacing stayed constant and that the vertical spacing changed. I asked about the forces and if this seemed consistent with what we know about the acceleration of the ball based on those forces. From there they jumped into worksheet 2. As they completed it again, Laura and I walked around engaging in dialogue, asking extension questions, as always, checking for understanding. We asked them to put a scale version of the motion map on a white board and MAN did they struggle! But we got out of them what we wanted, deep thought about projectile motion without having to rely on the equations as a crutch. Textbooks often put free fall and projectile motion before the forces unit. This is, in my opinion a serious problem in that there is no reason for the motion. Why does an object move with a constant velocity in the horizontal direction? Why does it move with a constant acceleration in the vertical direction? Without knowing about the forces there is no justification for the motion. I suppose you could just observe it and go from there but why not have a complete picture? After that we did some arts and crafts. This wasn't my finest moment but I still think it worked out well enough. I had them cut strings and tie them to beads so each bead hung at lengths of 5, 20, 45 and 80 cm; these are the same distances that a freely falling object falls in 1, 2, 3 and 4 seconds. I then asked them to tape them to a meter stick at equal horizontal intervals to model constant velocity. They were able to see how the beads modeled the parabolic motion of a horizontally shot projectile. I then got confused, gave bad directions, and wanted to curl up and die. From there we did two practicum challenges. The first was a steel ball bearing rolling down a ramp on to a track and then off. The goal was to hit the top of the cup on the floor. Why the top of the cup and not into the cup? I suppose no really good reason. My thought was that with a heavy ball and a light cup it wouldn't go in but just tip it over. If it hit the top then it might bounce right off! How cool would that be? But frankly I don't really try to do everything perfectly in these workshops. I occasionally fly by the seat of my pants or am purposefully vague. Because the teachers need to figure most of this our for themselves! I want them to say, "What was Don even doing? This is way better if I just ________." I hope they take this skeleton of a structure that I've imposed and make it their own. If they don't; if they try to imitate me they won't be as successful. So that is the question; how do you provide enough structure for it to make sense but not enough so that they are just following along and imitating? The groups were quite successful with this one! The second practicum involved a PASCO Projectile Launcher. I launched the little yellow ball and from the table to the floor. I then assigned each group and angle and told them they had to hit the top of the cup. This was wicked hard! In past workshops I've had a couple of content experts, teachers who were so good with the content (after teaching for 15 or 20 year) that nothing I threw at them was really hard. But this group if made up of new (some super new) teachers and others that haven't ever had to teach at this level that the activity proved to be WAY hard. But with a little coaching they were able to succeed on a level with which everyone was comfortable. Some groups even hit top of the cup. This qualifies as a "really hard" physics problem and the fact that a group got it to work is amazing!